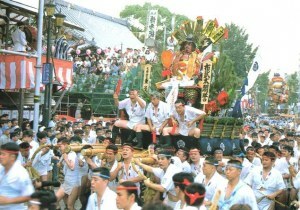 A resplendent and gallant summer festival with men racing through the streets while bearing 1-ton floats on their shoulders. Men carrying yamakasa, which are large 1-ton floats elaborately decorated for this festival, race through the streets of Hakata at full speed. The sight of the men concentrating all their energy into the floats captivates the hearts of the spectators who number as many as 1 million people.